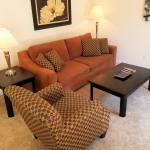 Set 14 km from San Jose and 47 km from Santa Cruz Grove 1802 offers accommodation in Sunnyvale. The air-conditioned unit is 35 km from Half Moon Bay. There is a dining area and a kitchen complete with a dishwasher an oven and microwave. Towels and bed linen are available in this self-catering accommodation. Other facilities at Grove 1802 include a fitness centre. Palo Alto is 12 km from Grove 1802 while San Mateo is 29 km from the property. The nearest airport is Mineta San Jose International Airport 11 km from the property.